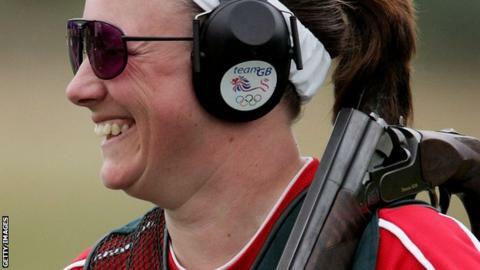 Britain's Sarah Wixey has won a silver medal in the women's trap at the Shotgun World Cup in the United States. The 43-year-old, who will compete for Wales at this year's Commonwealth Games, was defeated in the gold medal match in Tucson by Laetisha Scanlan. Having failed with her second shot, Wixey was on target with her next seven, then missed two in a row. She made each of her final four shots to tie the match at 12-12, but Australia's Scanlan won in a shoot-off. Wixey, who was born in Northampton, competed for Britain in the trap at the 2004 Olympics under her maiden name of Sarah Gibbins, finishing joint ninth. She competed in her first Commonwealth Games for Wales in 2006, having qualified under residency rules. Her husband Mike is competing at the Shotgun World Cup in the men's trap.